These Heavy Duty Binding Machines are a great way to increase productivity. Many of these machines come with interchangeable die capability which allows you to punch the paper hole patterns for various types of binding -- just slide in one of the quick change dies and you can punch the hole pattern for Coil Binding, Comb Binding, VeloBind, Wire Binding, ProClick and 3-Hole Punching. (Dies are sold individually and not all manufacturer's offer all of these punching patterns.) These punching machines can punch as many as 50 sheets at a time depending on the hole pattern. We also offer a wide range of finishing modular units that allows you to bind or close various binding methods. Among the various modular units are Coil Inserters, Wire Binding Closers, Comb Binders that allow you to attach them to many of the power punches. Also available is a Manual and Electric Paper Lift and an Automatic Paper Ejector and Stacker for increased productivity. CUSTOM HOLE PUNCHING DIES ARE NOW AVAILABLE TO MEET YOUR SPECIFIC NEEDS. CALL FOR A QUOTE. ONE STANDARD INTERCHANGEABLE DIE IS INCLUDED WITH PURCHASE OF ANY OF THESE HEAVY DUTY PUNCHING MACHINES. 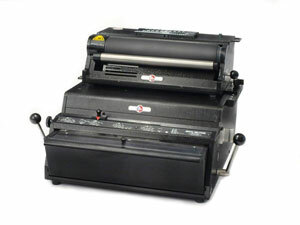 FREE SHIPPING ON ALL HEAVY DUTY BINDING MACHINES. Offers Electric Punching, Electric Coil Inserting And A Built-In Coil Crimper. The LED Control Panel Guides Users Throughout The Binding Process. Office Duty Foot Pedal Controlled Electric Punch with an Easy to Change Die System. Includes One Interchangeable Punching Die. Power Punch features the EZ Change Die System. Designed for Multiple Punch Patterns that can Punch up to 30 Sheets. Includes One Free Punching Die. Production Duty Punch and Heavy Duty Manual Wire Closer. Punches up to 28 Sheets and Closes Wire up to 14” in Length. One 3:1 or 2:1 Punching Die Included. Top of the Line Power Punch. Quick-Change Die System, Accu-Set Paper Stops, Automatic Reverse, Punches up to 14” and can Punch up to 55 Sheets. Includes One Interchangeable Punching Die. Combines Heavy Duty Paper Punching and Heavy Duty Semi-Automatic Wire Inserter And Closer. Punches up to 39 Sheets of 20# Paper. Wire Closer Inserts and Closes Wire in One Easy Step. One Free 3:1 or 2:1 Die Included. Heavy Duty Paper Punch will Punch up to 46 Sheets and the Comb Opener allows you to Bind up to 2” in Thickness. One Free Comb Die Included. Heavy Duty Coil Inserter with Adjustable Lower Roller for Inserting Coil up to 50mm. Includes a Coil Crimper and a 3 year limited manufacturer's warranty. Includes a 3 year limited manufacturer's warranty. Attaches To Any OD Or HD RHIN-O-TUFF Power Punch. Heavy Duty Wire Binding Inserter and Wire Closer. Inserts And Closes 3:1 Wire From 1/4'' To 9/16'', up to 14” in Length, In One Easy Step. Great for Calendars.